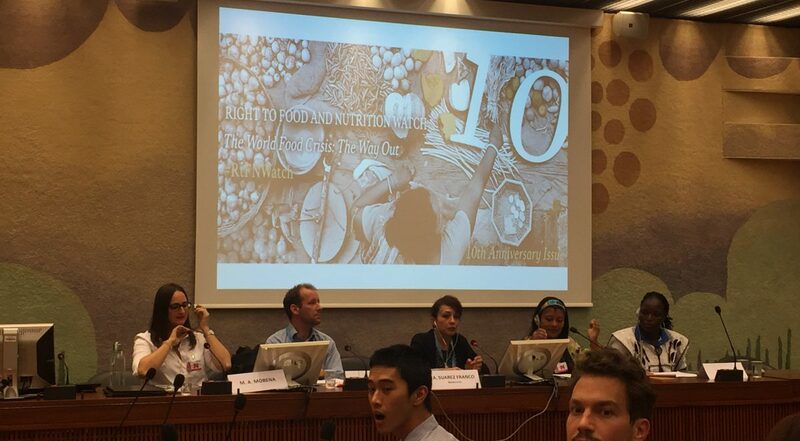 On October 19, the launch of the 10th anniversary issue of the Right to Food and Nutrition Watch took place at Palais des Nations, in Geneva. Coordinated by FIAN International, co-organized by IBFAN and other CSOs and social movements, the Watch launch took the form of a dynamic and interactive panel discussion. It was the chance to discuss the current challenges around the world food crisis, and possible ways to tackle the structural causes of it. Some topics discussed included the right to food, the rights of indigenous people, the role of transnational corporations and their interference with the enjoyment to the right to food, the need for human rights-based approaches in policy making, the importance of food sovereignty. The harmful effects of bad marketing practices on children’ diets were also mentioned. For IBFAN, it was also the occasion to share an important testimony from our group in Mexico on how infant feeding is being currently managed, after the earthquakes of last September. The report shows the recurrent failure to implement measures to protect breastfeeding and gives an interesting background to understand the current challenges for breastfeeding defenders in Mexico. The author, Marcos Arana Cedeño, contributed to the Watch with an important Insight article – Protecting Children’s Right to Food and Nutrition in Emergencies: Local Solutions Come First. Download the 10th Right to Food and Nutrition Watch here. Download the report Disasters in Mexico here.